Readers, I have a food confession. You might want to sit down for this one. I don’t like hamburgers. There, I said it. Don’t hate me. My husband however LOVES them. He could eat them daily if given the option. 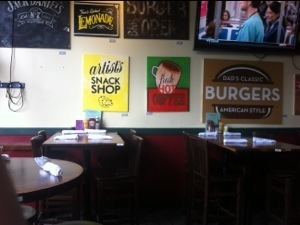 When I am on the search for the perfect slice of pizza he is always on the hunt for the perfect burger. And guess what? 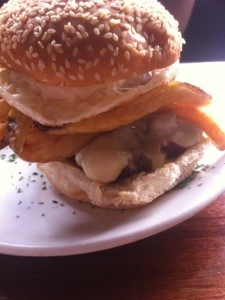 We found one this weekend – one of the BEST “bar burgers” in CT is at Burger Bar & Bistro in South Norwalk. 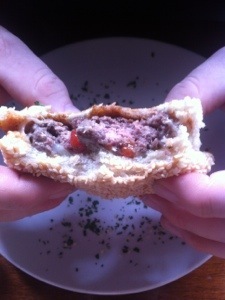 This burger is so good this girl, the food blogger who doesn’t like burgers, LIKED it! That’s right, this burger is so good I would order one myself. I’m talking about the one and only B.E.C. 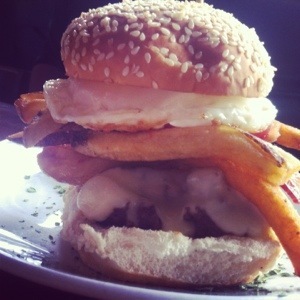 Burger: Thick Applewood Smoke Bacon, Runny Egg, Double American Cheese, Fries, and Spicy Ketchup. Why is the B.E.C. 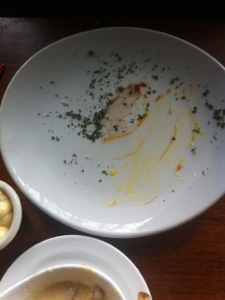 so amazing that I enjoyed it? The meat was cooked perfectly and the runny egg reminds me of hollandaise sauce, which along with the spicy ketchup (definitely not too spicy) kicks up the taste of this burger another notch. The fries, bacon, and cheese are a great added feature, and who doesn’t like fries, bacon, and cheese? All these parts combined makes this burger a one of a kind. 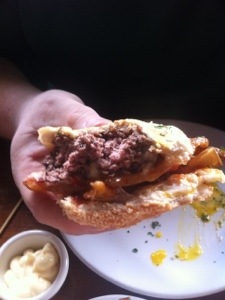 This is a burger to turn burger haters into burger lovers – I have been converted! 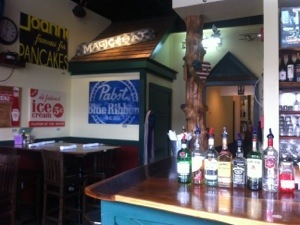 This was our first visit to Burger Bar & Bistro in South Norwalk. 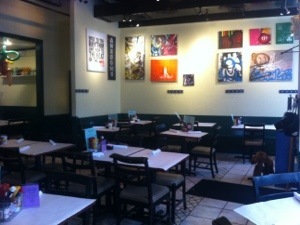 A friend who works nearby and visits for lunch regularly recommended we give it a try. 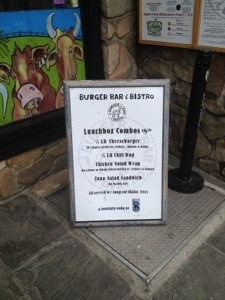 All I can say is as soon as we parked the car and crossed the street I knew we’d be putting Burger Bar & Bistro into our restaurant rotation. When we walked in and sat down we were already talking about what we should order on our next visit and who of our friends would want to come along. 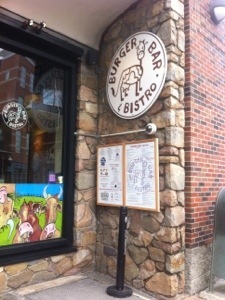 Burger Bar & Bistro has two distinct parts to the restuarant: the bar side, which the bartender, Arty, explained was the original restaurant, and the dining room side, a later addition a few years after they opened. Something I learned years ago from watching Rachel Ray’s tv shows is to always ask the locals and the staff what they’d recommend off the menu, and Arty’s recommendations were spot on – thanks Arty! 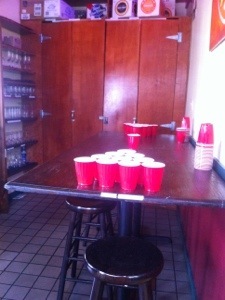 They have their very own beer pong table! 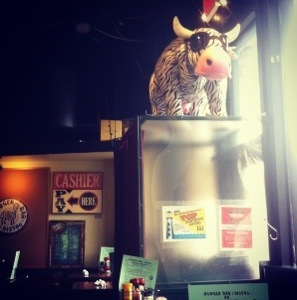 Burger Bar & Bistro is a family friendly restuarant and also has a kid’s menu. What else did we try on the menu during our visit? 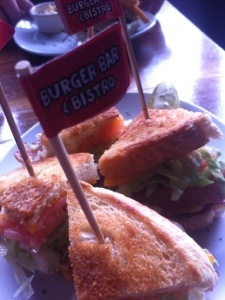 I ordered the BBLT: Double the Thick Cut Applewood Smoked Bacon, Lettuce, Tomato, and Mayo on Texas Toast. 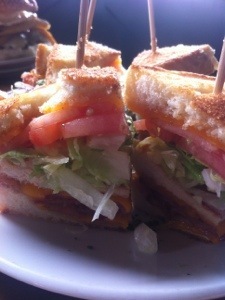 Hold the mayo and add cheddar cheese is how I prefer my BLT. 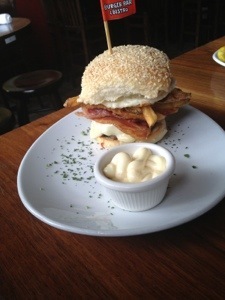 Similar to the burger, the bacon is cooked so it’s a chewy crispy combo – meaning bacon perfection – not so overcooked that it crunches and crumbles when you bite into it and not undercooked that’s it’s chewy and possibly difficult to eat. I had concerns the Texas toast would be too filling but it wasn’t, instead the toast gave a buttery grilled flavor and prevented the sandwich from being dry. The flag toothpicks were a small detail which made me smile, and isn’t that what it’s all about? Food makes us all happy, and thoughtfully prepared food is what we rave about to others (and what I blog about for you). 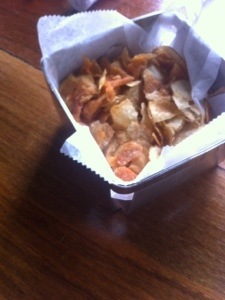 We split an order of the Disco Fries made with Brie Cheese and White Truffle Oil. The order is big enough for two to share or for one person who doesn’t feel like sharing. Something we learned with this dish is that most of the cheese and truffle oil is in the bottom of the dish with some of the mixture drizzled on top of the fries – this prevents the fries from becoming soggy and allows you to dip them in as much of the cheese and oil as you prefer. 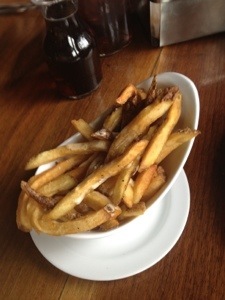 Plus if you have some of the cheese and oil mixture left, it’s also perfect for dipping the homemade potato chips that are brought to each table when you’re seated. A thoughtful detail I haven’t seen elsewhere, the Burger Bar & Bistro serves your drink with a small carafe of a second serving. 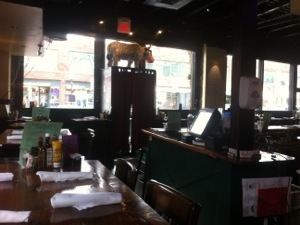 My iced tea came to the table with round 2 tagging along – I love this detail! Another sign that a burger joint has top notch burgers we have to tell everyone about is when my husband orders a second one. That’s right, he’s “a two burger kind of guy”. Round two was a 1/4 lb. burger with pepper jack added and a little ketchup. I must add that I am impressed with the menu at Burger Bistro & Bar, not only for the variety of burgers – everything from classic burgers to their signature burgers to eight different types of sliders or mini burgers, but also for the variety of other types of food such as soups and salads, a variety of Sidekicks or sides, and Burger Alternatives which include items like the Meatloaf Melt, Lobster Roll, and Salmon Filet Sandwich. 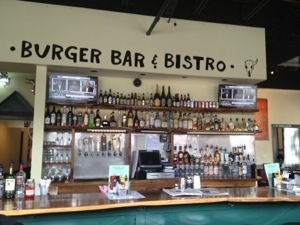 Burger Bar & Bistro has a full bar, and they are said to have the have the best milkshakes in town – regular or adult versions – and they’re on my must-try list for a future visit along with their floats: Brown Cow, Black Cow, or Orange Cow – ice cream with Root Beer, Cane Cola, or Orange Cream Soda. Hours of operation? 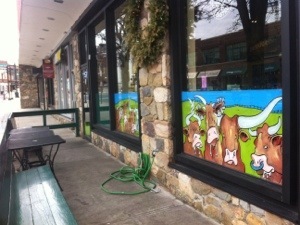 Their website says 11am-til the cows come home!